Katja got 5th at the EPT in Warsau! She earned herself (and me 😉 over €64,500 there which will go straight into our WSOP ‘warchest’. Well done! 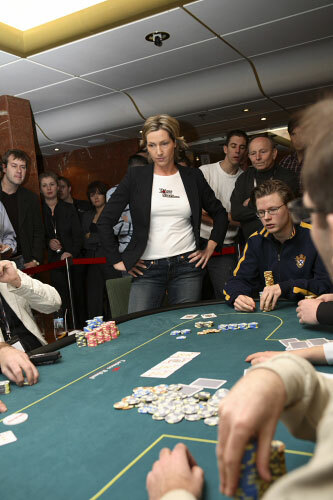 A few minutes after Katja busted (she went all-in with 2-2 on the button to be called by the BB with A-Q which won) I met with Sebastian to have a ‘big’ – it took us 3+ hours in one of Hamburg’s best restaurants to eat through all this first class food. Afterwards we went to our local Casino Schenefeld to play some cash games, hopefully with Hassan – Sebastian was full loaded, ready to ‘cover him’. Wow. Anyway, Hassan was not there but two tables NL 2/5 were going. We took a drink with Tony from PokerOlymp.de when two high rollers from our usual pot limit game asked if we would be interested in some shorthanded pot limit omaha. I was hot for it right away – Sebastian said he want this only with small blinds, like 5/10 (you chicken! ;). We all agreed but I added ‘you guys are all putting up live straddles, right?’ in fact creating a much bigger game. 10 minutes later the game was going, 6 handed. Nothing big happened for – 2 minutes. Then we had the first 4 way all-in pot (everybody was playing 500 euros or more). I did raise with A-T-5-5 on an unpaired, 9-high, nut flush draw flop. Two players called, one came over the top. I figured my odds and called for all my chips as did both other players. The turn paired the 9 and the river brought an offsuit Jack – the re-raiser announced that he had misread his hand and showed the 3rd nut flush draw (Q-8). Sebastian folded right away, he has been looking for some straight and Tony showed K-2 for the second nut flush draw. I said I had the best draw but failed and I could add a pair of fives to the open nines for two pairs. Big moan all around – nobody had anything! I won that pot with about 2,500 and the game was on! I promised to see every flop no matter how much from now on and played like this for 3 hours until I got too tired. As usual there have been some big pots and some bad rivers but I managed to win a nice chunk. In one spot I raised blind on the button, the SB reraised and a limper reraised all-in for over 1k. The small blind did not have that much and I was sure he was going to call so I called a €1.040 bet (100 was my initial raise) – blind! The board came down with 3 spades and the initial raised had something like kings up, small blind player folded. I started to squeeze – first card was a spade! I discovered the next card – black! but a club – the next: 6 of spades! Annother big pot for me – my hand was 3-4-5-6 double suited. Wow.